Specialty CME Credits: Included as part of the 4 credits, this CME activity is eligible for 4 Infectious Disease CME and 1.5 Pharmacology CME credits, subject to your state and institutional approval. Due to their anatomic, physiologic, developmental, and behavioral characteristics, children are particularly vulnerable to bioterrorism agents. Symptoms associated with most bioterrorism agents can be difficult to differentiate from common childhood illnesses. It is extremely important that emergency clinicians are able to recognize unusual illness patterns that could distinguish a natural outbreak from a bioterrorism attack. 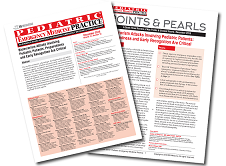 Resources available through government agencies and leading pediatric organizations can aid in diagnosis and treatment. 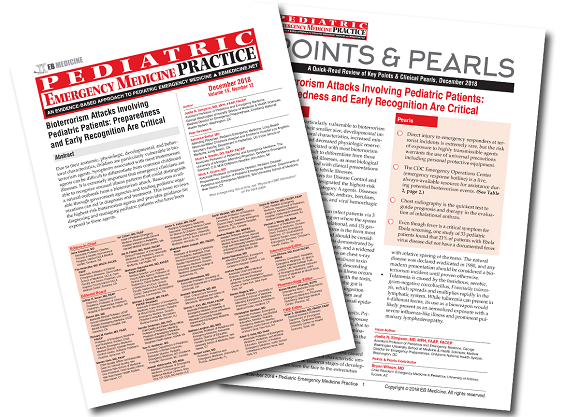 This issue reviews the highest-risk bioterrorism agents and provides guidance for diagnosing and managing pediatric patients who have been exposed to these agents. I found this a very succinct and well-organized review that focused on major agents to be concerned about. Other reviews I have read about potential bioterrorism agents were very much "inch deep, mile wide", with too many substances and agents reviewed and too overwhelming to feel that you would remember the salient points. With this review, I feel that I picked up some good pearls and useful recommendations for where to find quick information in a possible emergent situation. Very comprehensive review, well-organized, extremely helpful and adaptable information. Very well written article subjective patient should be in the back of every emergency medicine physician's differential diagnosis which can be easily overlook and busy ER. I will be more aware of the possibility of a bioterrorism case in a sick child as the result of this activity. Certainly increased awareness consideration of bioterrorism with the certain presentation of illness and in light of certain historical considerations. After reading this, I’ll consider bioterrorism when confronted with patients with fever and viral type symptoms that seem more severe in presentation, or has other uncommon characteristics that differ from the usual suspected, common childhood illnesses. I previously felt overwhelmed and unsure about my role in identifying bioterrorism but this article outlined basic steps for identifying possible bioterrorism cases and provided next steps for action. I'll consider these agents if unusual numbers or virulence ....as noted in the article, presentation is generally nonspecific, so challenging to sort out for the first several cases. Will have greater awareness of bioterrorism agents and watch for case clusters indicating a possible bioterrorism event. This article heightens my awareness of Bioterrorism, its presentation and the involvement of the CDC and the health department for guidance. Discussed the importance of isolation and protective equipment. I am now better prepared for possible bioterrorism events.